Capital Plumbing and Heating is pleased to announce they will soon be celebrating two important anniversaries in January. The first anniversary marks their 18 years of service to the Edmonton community. Part of Capital Plumbing’s long-term success comes from their commitment to providing excellent customer service. Each member of their staff, from technicians to managers, completes thorough training on the best ways to interact with customers. This has allowed them to rely on their customer base for the majority of their advertising; a constant circulation of client referrals has created a steady growth within the company. Capital Plumbing’s second milestone marks a decade since their induction into Success Group International (SGI). The company’s time with SGI has served to further boost their growth. SGI has influenced Capital Plumbing to switch industries in order to better focus on providing the best possible service to customers. The plumbing and heating companies recognizes every achievement they have reached is because of their satisfied customers. This is why they have devoted their services to help them handle any issues that may occur, regardless of the time or day. They strive to provide the quality solutions their customers need. 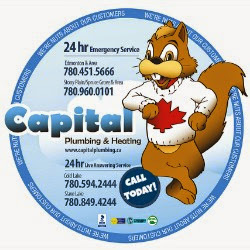 Anyone interested in learning more about Capital Plumbing can get in touch by calling 780-451-5666 or by visiting their website. About Capital Plumbing and Heating: Capital Plumbing and Heating is a full-service plumbing and heating company that strives to provide the utmost in customer service. The Capital Plumbing staff makes it their mission to serve their clients in the best ways possible. They strive to constantly improve their services in new and satisfactory ways.